I had such a great time photographing this handsome baby boy! Little L. was 3 months old but his adjusted age was 1.5 months due to early delivery at 34 wks. He was such a flirt and smiled so much. He did fall asleep near the end. I truly love capturing these moments for you and I am always humbled and honored when you choose me to take pictures of your family. Whether it’s savoring the memory of your bump, your first newborn, your toddlers first steps or your growing family….I love it all! I first met Meg at Panera to discuss my idea of birth photography and newborn photography . We hit it off and she signed the contract right there. We chatted via email a few times and discussed the type of birth photography she envisioned. Meg was scheduled to be induced on the 10th of April. So, being on call was much easier since I knew what day I would be photographing her birth. She was admitted into the hospital around 7 a.m., she was 4 cm. and they broke her water. I figured since it was a induction this would take a while even though this was her second pregnancy. Needless to say she was a rock star and delivered her baby only 3.5 hrs after being admitted into the hospital. I can share a few great images from the birth. I look forward to photographing little W. next week for his posed newborn photography session. Meet newborn Kerrigan. He is a beautiful little guy and slept like a champ for his newborn session. He made the cutest little faces while he slept! We used a new blue backdrop and wire bed for his session. This little sleeping beauty is Veronica and she is brand new around here! She was such a great sleeper for her session and then when it came time to take the last few photos, she woke up but gave me the sweetest smile. Her doggy brother was so sweet with her. Making her big debut on the blog today is precious newborn baby Cecilia photographed by yours truly, ) She is the sweetest little baby and really melted my heart during the entire session. Her big brother did amazing with her who I also got to photograph when he was a newborn too, so it was great to see him now playing the role of big brother! Big Brother was super excited to hold his new baby sister and have his picture taken as well. I wouldn’t be surprised if baby Cecilia grows up to be a model- she just looked so cute in everything we put her in and every pose we placed her in. Meet sweet baby Isabelle. This little lady was a doll. She was as beautiful as could be and is already so loved and adored by her beautiful parents. For Isabelle’s newborn photography session we used lots of neutrals and grey. This handsome little fella took a couple minutes to warm up to the cake smashing, but once he figured out it was fun he definitely gave us some great smiles! I have been photographing this guy from birth so I know that once he smiles they are camera worthy and oh so adorable! Twins are always fun to photograph. I travel to your home and bring the studio to you. The biggest challenge is getting them to sleep at the same time. I typically start with the sleepiest twin for their solo images while a parent is getting the other to sleep. Then I bring them together for sibling images, and finish up with the other twin’s solo images. I really enjoy working with twin families, and have so much respect for parents with twins! Having ONE newborn is challenging, so I can’t imagine what it’s like to have two! Anthony & Cole are fraternal twins who could not be more different, Anthony is tiny and delicate, about 5 lbs and his brother Cole has about 1.5 pounds heavier. It was so funny to see the two of them next to each other! I just love how genetics work out with siblings sometimes. After I finished photographing the babies, we moved on to the parent and family portion. There are lots of variations with two newborns that we’ll walk through, and I’ll assess your comfort level in how you hold them. Baby safety is the top priority , , so we won’t place babies in potentially risky positions even in your arms. I am always checking with you to make sure you feel that your baby is secure and that you have a good hold on them. We’ll be in constant communication during our time together about how you’re feeling and if you need a break to sit down and rest. Postpartum recovery is a process, and it’s normal to feel extra tired or to become a bit light headed after standing for a while. A six pound baby might not feel so heavy at first, but can feel like an anvil after ten minutes for a new mom. Enjoy just a few of my favorite images from Anthony & Cole’s newborn session! Welcome to the world Baby Jack ! Sending lots of love and big congratulations to these proud parents and newly promoted big sister. Thank you for having me document this special time in your lives! Can you believe we are close to Spring! I feel like this winter has dragged on, and I am so done with the cold! Which is why I am looking forward to Spring so much, I am so happy to see the trees beginning to bloom and the green and life slowly returning to the plants and trees in the area! Spring Mini sessions are NOW booking APRIL 28th & May 4th . Additional dates maybe added as necessary. Booking your baby's first professional portraits is truly exciting! You've waited months to meet the baby and have dreamed of holding them in your arms! Now that you've selected your photographer and are gearing up for a great session, you may be a little unsure what to wear to your newborn session. Have no fear! As a professional newborn photographer plus mom (I mean, I DO have three children !) I know how important these images are to you. You'll treasure them forever. You would like to look and feel your best. I'm here to guide you and provide an amazing, laid back experience for you new parents. First and foremost, moms should wear something that makes them feel beautiful and comfortable (after all.. you just had a little one!). The best advice really is to keep it simple. The best way to do this is by wearing a simple, solid-colored top. Light colored tops in creams, light grays, and light pastels help in keeping the focus on your expression and the moment. Mom can wear a long sleeve, or no sleeves. I prefer Dads to wear long sleeves but for one picture I would need Dad to wear a short sleeve shirt or no shirt. The sibling portion always makes mom's heart soar! This is a very popular request for sessions and we set aside an additional 30 minutes for these setups. I like to pose the older sibling on their back while the eldest child holds the new baby. This is a safe way for them to interact without worrying if the baby will be dropped. A neutral colored flokati, such as cream or white, is a really pretty option here. Little ones look super precious in classic, natural attire such as dark wash blue jeans, perhaps even khaki pants, and then a simple top in a lighter color, such as beige, cream, white, or tan. Each family is unique and different. These tips are here to help decide what to wear for your baby photoshoot. Though neutrals and light colors are recommended… if you love color, don’t be afraid to rock it! But nothing neon. If you are still unsure, let me know… I’m here to help you along each step of the way! Sharing this sweet little babe on the blog today. Nothing beats newborn photography for me, this is my favorite type of photography...Just the newness of the little one and the excitement to document a new addition to a family is so special to me. I am so thankful for every set of new parents that allow me into their homes to photograph their new baby. Here are my favorites from this session. I first worked with Mercedes and Ryan for their first maternity session and newborn session with their first daughter. I was thrilled to hear from Mercedes again letting me know she was pregnant with her second child, a baby girl. They loved their experience with us and wanted to work with us again for her new daughters session. I absolutely love seeing my clients throughout the years for different sessions as their family and children grow. Since Mercedes had worked with us previously, she knew exactly what to expect from our time together. Baby A. was a great sleeper and BIG sister M. was only 17 months old but made my job look easy photographing them both. You choose the day in Feb that works for you. Now booking Studio Christmas minis! These are SO much fun, and the images are perfect for holiday cards or grandparent presents. Christmas Minis are 15 minutes long and include 5 digital images, to be delivered via a downloadable online gallery within 2 weeks of your session. You get to choose the images, and can purchase additional ones, if desired. Images show our setups, they are large enough to fit up to 5 children from the same family. Our studio is located in Short Pump, VA A Deposit it due to hold your spot. To book, email me with the time and date you wish to book. These sessions are booked between 10 a.m. - 1 p.m. . Please arrive 5 minutes early, dressed and ready to go. There are no refunds for no-show clients. The cost is $140 plus tax. A beautiful early morning for a fall family session. The colors were gorgeous and so was the family. Its that time of year again! Don't miss out on our Christmas Mini Sessions at Windy Knoll Tree Farms! Their property is stunning! Bring the family for a fun filled photo shoot! If you are looking to have beautiful photos on your Christmas cards this year, then make sure you book soon! 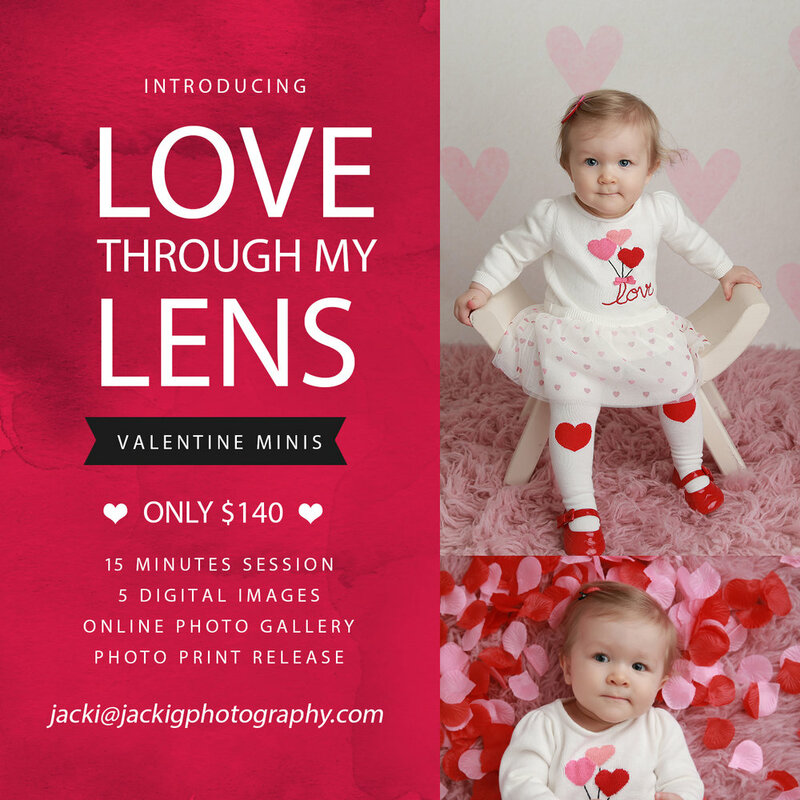 Sessions are $140 plus tax for 15 minutes with 5 digital images with print release. Dec. 1, 2018. There are only a limited amount of sessions available. Please comment with the time and email me so we can get your Christmas Mini session scheduled. Spots are limited! Please book early.